OS grid reference NY 1006 6821. About ½ a mile to the north of Ruthwell village in the Scottish borders, near Annan, is Ruthwell parish church and housed within is The Ruthwell Cross, a quite spectacular Anglo-Saxon (Northumbrian) cross dating from the late 7th to early 8th century, and which also has Norse carvings, some Germanic influence and a runic inscription. It is considered by historians to be one of the most important of the early Christian, Dark-Age crosses in Europe. The church stands beside the country lane to Newfield, close by Aiket farm, a short distance to the east of the B724 Annan road. Dumfries is 6 miles to the north-west. The cross stands in the church apse that had to be specially built to accomodate the monument that is 18 feet (5.3 metres) in height; the base of the shaft being set below the level of the floor. Originally it stood outside in the churchyard where in 1642 it was toppled and broke up by the Scottish Church authorities, but in 1800 a local clergyman, Reverend Duncan, realising it’s importance decided to assemble the pieces of cross-shaft which was finally placed inside the church for safety in 1823. A large part of the cross-head was missing and badly damaged, especially the arms, and so it had to be entirely rebuilt with what fragments were available, but I must say a fairly good job has been done. The rest of the tall cross-shaft had also been broken in several places and has had to be rebuilt with the original sections set into their proper places and, once again a brilliant job has been done. 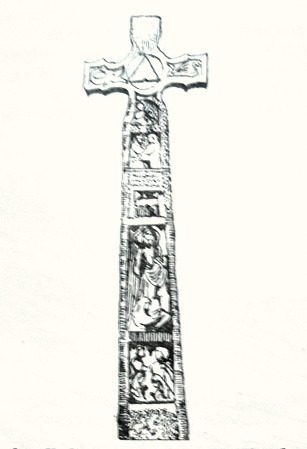 The north face (front) of the cross-shaft has some pretty astounding carvings. Christ is shown in magesty (glory) standing upon the heads of two beasts, a sign of his triumph over evil; also Christ’s crucifixion, St John the Evangelist with his eagle, St Matthew, St John the Baptist holding the Agnus Dei (Lamb of God) with a cruciform numbus around it’s head and a cross in it’s front foot; also a vexillum – a cross-inscibed banner. Around the front edges there are 18 of the earliest ‘extant’ Northumbrian dialect verses from the epic English poem ‘The Dream of The Rood’ that is in both runic and Latin. In the 7th century the Scottish borders came under the control of the Northumbrian kingdom of Deira. On the opposite (south) face St Mary Magdalene tenderly washes (annoints) the feet of Christ. On the west face another runic inscription along with some beautifully carved and very delicate interlinking vinescrolls, incorporating many strange looking creatures; the east face also has interlinking vinescrolls. Other figures on the south face include two figures embracing, often thought to be Mary and Martha, an archer, the Virgin Mary and baby Jesus on a donkey. Other carvings on the cross include various strange animals and human figures, two of which could be St Paul & St Anthony breaking bread? This truely is a masterpiece of Early English Anglo-Saxon craftsmanship with Scandinavian and, possibly Germanic influence, that can only be equalled by a few of the Celtic high crosses in Ireland. 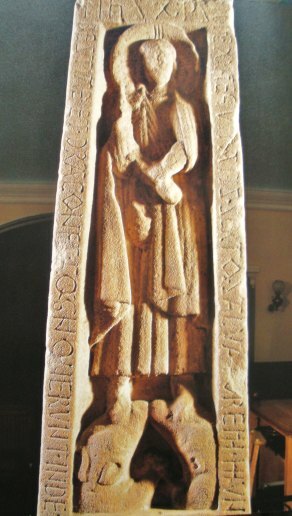 When the Ruthwell Cross was first set up it would have been painted in some quite vivid colours – what a sight it must have been for the early Christians of northern Britain. There is some uncertainty about the age of the cross, but it was probably carved somewhere between 660-700 AD? Bord, Janet & Colin., Ancient Mysteries Of Britain, Diamond Books (Harper Collins Publishers Ltd)., 1994. Breeze, David, J., Historic Scotland, Batsford Ltd., London, 1998. The Automobile Association, Illustrated Road Book Of Scotland, 1963. Humphrey, Rob; Reid, Donald & Tarrant, Paul., Scotland – The Rough Guide (4th Edition), The Rough Guides Ltd., London, 2000. Bottomley, Frank., The Church Explorer’s Guide, Kaye & Ward, London, 1978. Categories: Ancient Crosses, The Ruthwell Cross in Dumfries and Galloway in Scotland | Tags: Ancient Crosses, The Ruthwell Cross in Dumfries And Galloway Scotland | Permalink.